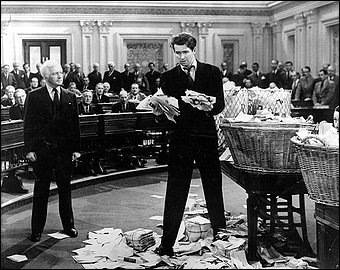 Senate Democrats do not have the votes to lower the 60-vote threshold to cut off filibusters. The lack of support among a handful of Senate Democratic incumbents is a major blow to the effort to change the upper chamber’s rules. Five Senate Democrats have said they will not support a lowering of the 60-vote bar necessary to pass legislation. Another four lawmakers say they are wary about such a change and would be hesitant to support it. [T]he equal vote allowed to each State is at once a constitutional recognition of the portion of sovereignty remaining in the individual States, and an instrument for preserving that residuary sovereignty. So far the equality ought to be no less acceptable to the large than to the small States; since they are not less solicitous to guard, by every possible expedient, against an improper consolidation of the States into one simple republic. The “Senatorial saucer” conversation between George Washington and Thomas Jefferson is part of U.S. Senate legend. Jefferson had returned from France and was breakfasting with Washington. Jefferson asked Washington why he agreed to have a Senate. It’s unclear if this conversation ever actually took place, and it’s probable it didn’t, but it nonetheless describes quite aptly the role the Senate, and the filibuster, plays in our system. There’s no reason to change it. The nine senators wary of or opposed to abolishing the filibuster include some of the caucus’ most conservative members, including Max Baucus, Ben Nelson, and Mark Pryor. And that’s hardly surprising. When it takes 60 senators to pass all legislation, the Democratic leadership has to rely on these people not only for their votes but also for their cache among Republicans. In other words, Democrats aren’t going to get Charles Grassley to vote for a bill if Max Baucus doesn’t vote for it, too. That’s going to matter even more next year, after the elections, if/when the Democrats lose seats and need Grassley (plus a few others) to move legislation. Of course, the filibuster empowers individual Democrats at the expense of the party as a whole. If it’s sixty-votes-or-bust for the next few years, Democrats may be done passing major initiatives. One of the problems with thinking about these things is that our eyes are often fixed on the present. With the Democrats at 59 Senators, it’s easy to focus on the threshhold of 60 votes for getting cloture, especially with Republicans using a rejectionist strategy pegged to requiring cloture to be achieved on every bill and nomination. It’s worth stepping back and remembering that Senate majorities are usually smaller, and often much smaller. Needing 60 has certainly made a difference in this Congress, but the filibuster may be a whole lot less important in other Congresses (as in cases of divided government). That doesn’t mean that reform is a bad idea, but only to realize that for Democrats, this is more likely to be a 2013 problem than a 2011 problem. That said, what I’d advise reformers to do is to concentrate their efforts on urging candidates to take strong stands on the issue. When the time comes for action, which Democrats hope will be at the beginning of the 113th Congress in January 2013, they want as many Senators as possible to be committed to change. The second thing I’d recommend is for reformers to prepare a package of relatively minor changes for January 2011, in order to demonstrate the point that each Senate can effect rules changes by majority vote. Again, unless there’s a surprise Democratic sweep this November, I wouldn’t worry so much about pressing senior and marginal Democratic Senators on lowering the 60 vote needed for cloture. Instead, I would try to find smaller streamlining procedural reforms that are relatively noncontroversial on their own (such as, perhaps, eliminating the filibuster on the motion to proceed, or changing for needing 60 for cloture to needing 41 to stop cloture) — whatever procedures, no matter how insignificant they may be substantively, that marginal and senior Dems are willing to support — and press to have a majority-rules vote on implementing them. I’m broadly pro-filibuster, but then I have an aversion to legislative activity, so that’s hardly surprising. But whether or not you support it, I see little hope of changing it unless we get a long period–ten or so years–of single-party dominance. At this point, Democrats would be crazy to do this. They’d get a few months before they lose so many seats in the House that–even if they don’t lose entirely–they won’t have enough votes to do much. And in exchange, they risk empowering a Republican Senate majority–if not in 2010 (which I think is very unlikely) then in 2012. It’s absolutely true that Reagan and others had less popularity at this point in their presidency than Obama. Unfortunately for Obama, financial crises take a long time to recover from. The recession that ate away the popularity of Reagan was a classic monetary contraction that led to a boom as soon as Fed Chair Paul Volcker loosened his iron grip. There’s a very good chance that in two years, Obama is still going to be trying to explain why unemployment is above 8% and GDP is kind of anemic. If that’s the case, the Republicans will hold the house and the senate at the end of 2012. Mind you, I’m not saying that this chance is above 50%. But a 35% chance is a pretty big risk. Democrats are strategically correct to focus on consolidating and defending the gains they’ve gotten, rather than risk having all of it undone in order to make a few lesser gains. I understand that it’s hard for progressives to say that the major progressive achievements under this administration are pretty much all in the past. But the leadership is saving them from themselves. I really wish people would stop treating this kind of consideration as a knock-down refutation of the case for reform. I really and truly think it would be better to let the Senate vote by majority rules. That’s what I thought in 2005, it’s what I think in 2010, and it’s what I’ll think in 2015. But anyone who is holding out on reform out of fear of empowering future Republican majorities should consider that for all the reasons Democrats will have the chance to change the rules in January 2011, Republicans will be able to change the rules in 2013 or 2015 or whenever else. The only reason filibustering has been allowed for as long as it has has been because of strong norms against its over-use. But those norms have been eroding for decades. The idea that Senate majorities are going to allow this trend to continue indefinitely is silly. The way this movie goes is that the downward spiral of obstruction continues until some majority gets sick of it and changes the rules. The question is when will the rules change not will they be changed. The constitutional option gets its name from Article I, Section V of the Constitution, which states that “Each House may determine the Rules of its Proceedings.” In order to fulfill this constitutional order, the Senate must be able to, well, determine its rules. A filibuster, technically, is a way to stop the Senate from determining something by refusing to allow it to move to a vote. Because stopping the Senate from considering its own rules would be unconstitutional, the chair can rule against the filibuster, and the Senate could then move to change its rules on a majority vote. One caveat: Many people, including Udall himself, believe this has to happen at the beginning of a new Congress. If it doesn’t happen at the beginning of a new Congress, then Congress is considered to have acquiesced to the previous Congress’s rules, and a filibuster against further rule changes wouldn’t interrupt the constitutional right to determine the rules. This is not a radical theory, or a partisan one: Both Richard Nixon, then the vice president and thus the president of the Senate, and Robert Byrd, then majority leader and considered the greatest parliamentarian to ever walk the chamber, have argued in favor of the constitutional option. Martin Gold recounted Nixon’s argument in a 2004 article for the Harvard Law Review: “Nixon reasoned that because no Senate could deny a future Senate the ability to exercise a constitutional right, and because Rule XXII, paragraph three [the filibuster] “in practice” prevented a majority of Senators from adopting new rules, Rule XXII, paragraph three, was unconstitutional,” at least when it came to blocking consideration of new rules. Byrd was even pithier: “This Congress is not obliged to be bound by the dead hand of the past,” he said. But for all the theory, the constitutional option has never quite been used in practice. Instead, it’s been repeatedly, and effectively, almost used. In 1917, Senate reformers were ready to use against the filibuster. A compromise was brokered, and that’s how cloture — the ability to shut off a filibuster — was created. In 1975, reformers again were ready to wield it against the filibuster, and this time, a motion to uphold the constitutional option passed and a motion to table it failed. And again, a compromise was brokered, this time bringing the number of votes necessary to breach the filibuster down from two-thirds of the Senate to three-fifths. The option was also considered for various reasons in 1953, 1957, 1961, 1963, 1967, 1969, 1971, and 1979. And that gets to the real role that the constitutional option could play: If Democrats lay out a clear path to changing the rules through a majority vote, and if they show enough unity to convince Republicans that they’ll really try it, you might see a hasty decision to reach some sort of bipartisan compromise on the rules. But if Democrats push this strategy only to find themselves unable to follow through on it, they may find that they’ve lost their ability to protest rules changes if Republicans decide to pursue the same strategy when they eventually retake the Senate. The trick, of course, is getting the necessary 51 votes in January. Democrats may find themselves short, if the midterms turn into a tsunami. Even if they have 52 or 53 votes, enough Democrats have to stand for re-election in 2012 that the remaining Democrats may wish to consider whether they want to hand a filibuster-buster to a majority Republican chamber in 2013. The 2006 election was particularly good to Democrats in the Senate, and they’ll be defending a lot more seats than the GOP — likely with an unpopular President at the top of the ticket. Under Ezra’s scenario (which is well researched, by the way, so read it all), the incoming majority of the 113th Congress could simply adopt the filibuster-buster rule from the 112th Congress by not making any changes to it. It’s a default at that point, and Republicans would have to act to allow Democrats to have filibuster power. If the GOP defeats Obama in that same election, it means no more judicial filibusters, no way to stop legislation, and the elimination of the need to consult across the aisle at all. So will they want an unfettered President Palin or President Jindal, for example, to appoint judges to the Supreme Court and lower benches? Leave themselves with no way to stop a Republican agenda led by a President Daniels or a President Herman Cain? If they find that palatable, then expect the much-smaller Democratic majority to sign up for that notion in January, if it exists at all. I suspect that most Democrats have been in the Senate long enough to know how it works to be in the minority — and that the same folks on the Left who want to eliminate the filibuster will bemoan its absence shortly thereafter.